Rumbling by Ecuador's Tungurahua volcano has forced the evacuation of at least 1,000 villagers, authorities said Sunday. Some 300 families from 10 hamlets on the western slopes of the 16,400-foot volcano, 80 miles southeast of Quito, have been evacuated as a precautionary measure. "The intense activity has forced us to put into effect a voluntary contingency and evacuation plan," Pablo Morillo, the head of emergency operations, told The Associated Press by telephone. He said the measure involves moving people at night to shelters a safe distance away from the volcano. They are allowed to return by day to their homes to tend to their crops and animals. But Juan Salazar, mayor of Penipe, said authorities of the 10 villages are requesting the government resettle evacuated families in other areas so that they don't have to return to the endangered zones. "The volcano is totally plugged up and the roars (from inside) are making people nervous," he said. 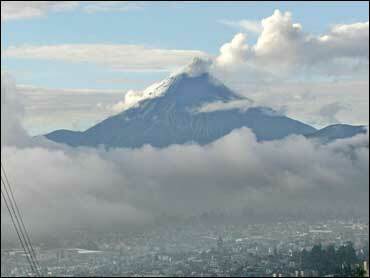 The latest report from Ecuador's Geophysics Institute said the activity could become more intense in coming days. The institute said the volcano has spewed ash but there have been no lava flows.